Six months ago, I was blessed to adopt my second child. This is a very intimate post, but I've been asked by a lot of loved ones about our adoption journey, so be prepared for something long and personal. The story of how we found our son is pretty amazing to us. Last year when we knew we wanted to adopt again, we looked at a lot of options to do so, including going through various adoption websites and agencies. In the end, we had a strong feeling that we shouldn't do any of those things but should instead try spreading the word through social media. We prayed to be guided on how to do that, and in mid-December, a friend texted me telling me that she'd seen something on Facebook about an adoption awareness challenge. My husband and I talked it over and felt like we should do it. On January 1st, we started a 60 day social media challenge, where we (along with other hopeful adoptive parents) posted a picture with some information about us on all our social media platforms. Every day had a different focus--our home, our favorite foods, our most cherished traditions, etc. It was difficult to make every day informative, fun, and uniquely us, and I spent a lot of time on every post (a lot of time.) We got a great response from our friends and family, and it meant a lot to us to see people sharing our posts in support of us. On day 36, a friend from an old ward (church congregation) shared one of my posts with her followers. Shortly after she posted, a woman replied telling my friend to have us reach out to her husband. Interestingly, the woman who responded was the daughter of our bishop and my visiting teaching companion in an old ward, the same ward where my friend still lives. The woman who responded is married to an attorney who facilitates adoptions for Marshallese families who live in the States (about 10% of the Marshallese population lives in and around Arkansas; the attorney served his mission in the Marshall Islands, so he speaks the language fluently and knows the people and their culture very well). Oddly enough, my old VT companion had actually mentioned him to me back when we were doing fertility treatments, but I didn't think twice about it at the time. My friend's referral couldn't have been more timely. We spoke to the attorney on February 26th, and he told us that he had some placements to make soon and that we could be chosen by a birth mom within a month (which we didn't even remotely believe--we'd been in the praying-for-a-baby business for too long). But then three weeks later (March 14th), we got a phone call saying a birth mom had picked us and was due in a month. We were floored, and I can't begin to explain how excited and happy we felt. But almost immediately afterwards, I was struck with almost crippling anxiety that I couldn't shake. I was terrified this anxiety was a sign from Heavenly Father that we shouldn't adopt. I'd never felt real anxiety before, and it was awful. I couldn't sleep or focus on anything. I wanted to move forward, and when I fasted and prayed about doing so, I would feel peace instantly. But then it would be replaced with overwhelming anxiety again. I didn't know what to do. All the while, I had this strong feeling in the back of my mind that I can't really explain, but it was essentially this: E (our daughter) was the child of my hope; my next would be the child of my faith. With E, my mom, who passed away when I was little, appeared to multiple members of the birth family (and I look just like her, so they recognized me instantly when they found our profile). There was no question about the Lord's will for any of us. But with this...I was afraid of making a mistake. I wasn't looking for another miracle, just an answer to my prayers, but the constant feelings of panic were obscuring my ability to receive that answer. After about three or four days of this, I felt prompted to call a dear friend who has dealt with anxiety for years. I told her everything I was feeling, and after she listened to me, she said, "I don't know if this is your baby or not, but I can tell you this: the Lord doesn't work in anxiety." Immediately, I felt the Spirit so strongly, the anxiety disappeared. It was an unquestionable confirmation that her words were true. I felt like I could see and think through things with complete clarity, and suddenly, the opportunity we were being presented with felt incredible and exciting again. When my husband and I talked and prayed that night, it was so obvious to us that everything about this situation was a direct answer to our prayers. We had felt we needed to do a social media effort instead of going through an agency. We had been led to a challenge that led a friend of ours to share a post, which in turn led us to our attorney, who led us to our birth mom. Everything about the situation was the result of very specific prayers, not just by us, but by our loved ones. It felt perfectly right. The next day, we reached out to our attorney and told him we wanted to proceed. By the end of the following week, we got the phone call that our birth mom had gone into labor three weeks early! After a full day of scrambling to get our last doctor's appointments and paperwork signed off, we packed up and were on a plane with our daughter the next morning to Arkansas, where our birth mom and baby were. Our daughter couldn't have been sweeter or more patient the whole day, despite the unholy hour of our wake-up and departure. We were all filled with a nervous excitement. When we finally walked into the hospital room and laid eyes on our son, the Spirit in the room was undeniable. I knew my baby, knew his soul. In that moment, I knew I'd been looking for and waiting for HIM, not just for a baby. It was like a missing puzzle piece was finally put in place. I just knew. This quote has been on our wall for the last 8 years. I've always been a firm believer that simple things make a big difference. I try to follow through on promptings I get to do good, but honestly, I have about a 65% follow through rate. These past months our friends were hoping to adopt and I felt prompted to pray with all my might and repost their message on my accounts. That led to a comment which I followed through on and a few FB conversations and now my sweet friend has a baby in her arms (obviously they had to do much more than that but my role was easy). Moral of the story: God knows we are imperfect. He knows we often fail. But often He prompts us to do small and simple things to bring about miracles...even if we only have a 65% follow through rate. In private, she shared a little more of the story with me, including a comment that profoundly struck me. She said she felt my mom was watching over this baby, just as she was for my daughter. Then she said that she felt there was a Relief Society of sisters on the other side of the veil from all nations watching over us (and people in our situations). The truth of her words speaks to my soul. Miracles happen. They have happened to me. In every way, I know that my baby boy was intended to be a part of my family (and I won't get into all of those reasons). He brings so much joy and love to our world. He truly is the child of my faith. Once again - tears. Tears of joy and and miracles and peace. Love your sweet beautiful family. Congratulations on your new arrival! What gifts you have been given! Katy, you are just lovely. And this story was just lovely. Also, it came at a particularly meaningful time for me too. I haven't been keeping up with reading the blog for quite a while, but I checked today and saw your post. So hooray for more answered prayers! This brought tears to my eyes. Thank you for sharing your story. 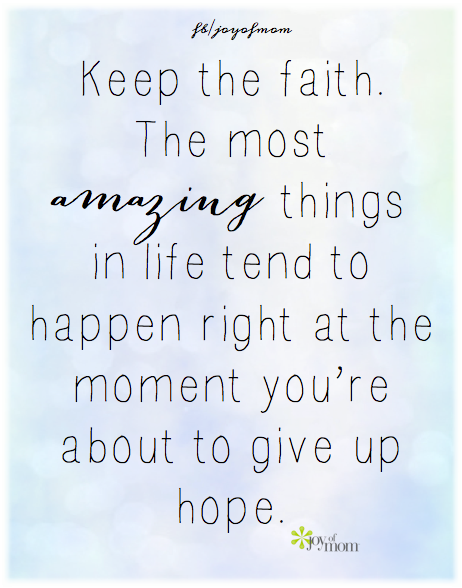 Having faith isn't easy, but when we remember the miracles that often proceed, our faith is a small price to pay. Oh, Katy, I am so thrilled for you and your family! Beautiful story of love. Brings spiritual sobs! We know your joy! Just had a wonderful surprise from our two, now adult, adopted sons & natural birth daughter. It was glorious to once again have them in our home. We rejoice in reading your experience. 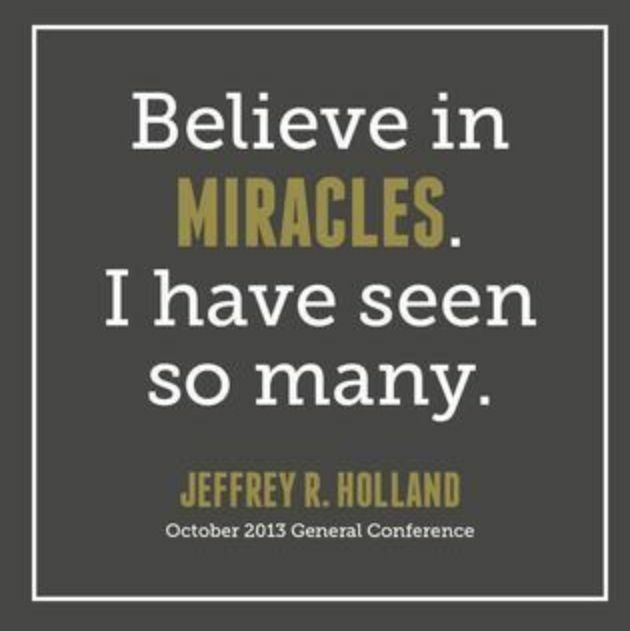 It is amazing what happens when we follow the direction of the Savior in our lives. May you & your family continue to be blessed. Many hugs! Crying now. Thanks for sharing your very personal story. Love you lots! This is so, so beautiful! Thank you so much for sharing this. Warmed my heart and touched my spirit.